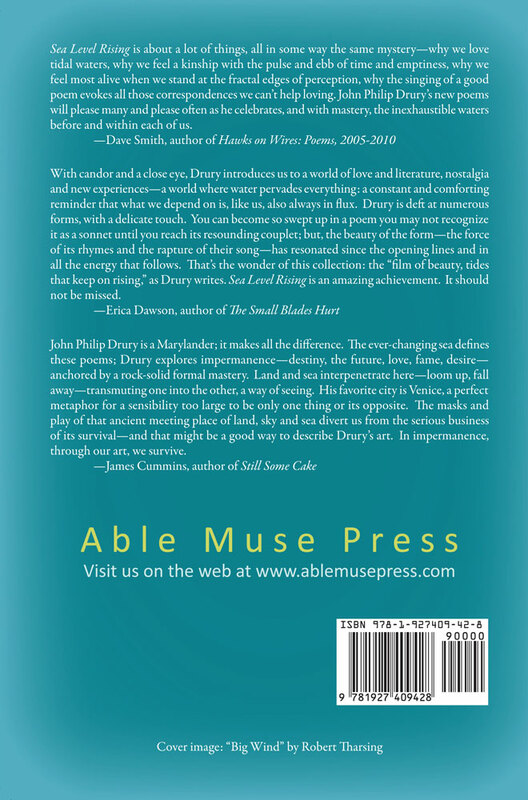 Sea Level Rising, John Philip Drury’s fourth collection, revels in water—flowing through rivers, splashing on quays and docked vessels, the wake of speeding boats, the elusive tang of sea salt in the heart of the prairie, even the water of baptism that rebirths the believer. The uplifting lure of water, as with a pair of honeymooners in Venice, may inspire a love “eager to divorce/ anything impeding its energy.” Our state of being might mirror water’s when “everything’s in flux, repeated spasms/ of wake and wave, bright sun, reflecting pool,/ surges made up of intricate detail.” The waves of music, like those of water, are also prominent in the musings of this collection, where that which “rises and returns/ approaches music, a blessing/ beyond sound.” These are masterfully crafted poems of uncommon inspiration, and they whelm with a celebration and longing for that which ebbs or flows inside us. Sea Level Rising is about a lot of things, all in some way the same mystery—why we love tidal waters, why we feel a kinship with the pulse and ebb of time and emptiness, why we feel most alive when we stand at the fractal edges of perception, why the singing of a good poem evokes all those correspondences we can’t help loving. John Philip Drury’s new poems will please many and please often as he celebrates, and with mastery, the inexhaustible waters before and within each of us. With candor and a close eye, Drury introduces us to a world of love and literature, nostalgia and new experiences—a world where water pervades everything: a constant and comforting reminder that what we depend on is, like us, also always in flux. Drury is deft at numerous forms, with a delicate touch. You can become so swept up in a poem you may not recognize it as a sonnet until you reach its resounding couplet; but, the beauty of the form—the force of its rhymes and the rapture of their song—has resonated since the opening lines and in all the energy that follows. That’s the wonder of this collection: the “film of beauty, tides that keep on rising,” as Drury writes. 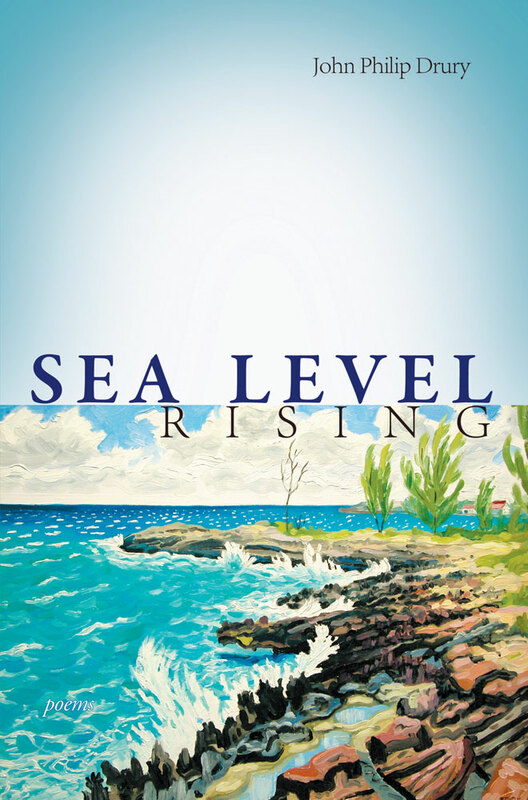 Sea Level Rising is an amazing achievement. It should not be missed. John Philip Drury is a Marylander; it makes all the difference. The ever-changing sea defines these poems; Drury explores impermanence—destiny, the future, love, fame, desire—anchored by a rock-solid formal mastery. Land and sea interpenetrate here—loom up, fall away—transmuting one into the other, a way of seeing. His favorite city is Venice, a perfect metaphor for a sensibility too large to be only one thing or its opposite. The masks and play of that ancient meeting place of land, sky and sea divert us from the serious business of its survival—and that might be a good way to describe Drury’s art. In impermanence, through our art, we survive. John Philip Drury is the author of three previous books of poetry: The Refugee Camp (Turning Point Books, 2011), Burning the Aspern Papers (Miami University Press, 2003), and The Disappearing Town (Miami University Press, 2000). He has also written The Poetry Dictionary and Creating Poetry, both published by Writer’s Digest Books. His awards include a Pushcart Prize, two Ohio Arts Council grants, an Ingram Merrill Foundation fellowship, and the Bernard F. Conners Prize from The Paris Review. He is a Professor of English at the University of Cincinnati.